The services of a good accountant can be invaluable to your small business. A good bookkeeper will do a great job of keeping records, but to navigate the maze of tax laws and provide the financial advice you need to manage and grow your business you need an accountant. While we tend to associate accountants with taxes, keeping you abreast of tax changes and doing your taxes are not the only services a good accountant provides. Whether you're wondering whether or not to incorporate your business or trying to decide if you should buy or lease or purchase commercial space, a good accountant will be able to tell you how such a move would affect your taxes and/or your business's growth. If you don't have an accountant working for your business, you need one! But it's important to take the time to find the accountant that's best for you and your specific situation. 1) Referrals - ask other business people about their accountants. Find out who other business people use and how satisfied they are with the services their accountant provides. If you don't or can't get any worthy referrals using this method, use the internet or yellow pages and choose several accounting firms. When you call, tell the receptionist what you do and ask for the name(s) of accountants familiar with your type of business. Use this information to create a shortlist of prospective accountants. 2) Call the four or five accountants you've selected and ask to discuss their services. Ask him or her about his education (such as whether he's a CA or CGA) and about his experience with your industry. You can also check with their professional association to see if their stated qualifications are valid and there are no outstanding disciplinary issues. Use this first contact information to choose two or three accountants to interview. 3) Prepare a short list of questions you want to ask prospective accountants. Don't be shy about asking about billing. Ask about billing rates and how these are determined. Often you may have a quick question that can be answered via a short phone call or email - how do they bill phone or email advice? And find out what your new prospective accountant will charge for a basic business tax return. (Be prepared to take in a copy of your previous year's return when you meet with them and ask them to give you a rough estimate of the cost of preparation). If your business is internet related, you'll want to find out if the accountant is familiar with ecommerce. If your business involves periods of work in other countries, you need an accountant that's knowledgeable about international tax issues. For instance, if you are Canadian and wish to do business in the U.S. you need someone who is familiar with the IRS and has experience completing U.S. tax forms (or has easy access to someone else who does, such as another specialist who works in the same firm). If you're thinking about exporting, ask how the accountant might help you develop an export strategy. 5) Meet with the prospective accountant(s) you've chosen, and ask your questions. There's nothing like a face-to-face meeting for gauging how well you might work with another person. 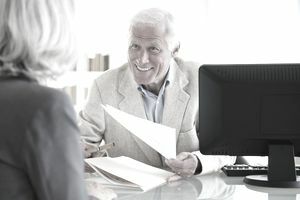 Besides assessing the accountant's knowledge, see how comfortable you are with him or her and how well the two of you communicate with each other. When you choose an accountant for your business you're going to be establishing a long term relationship, so feeling comfortable with them is important. After all, an accountant isn't just a tax preparer; he or she can help you build a blueprint for the future of your business. Thinking of Claiming Business Expenses Without Receipts? Don't!